We just bought a whole hog from a local farmer and had it processed. Now, we have awesome ham steaks, bacon, roasts and sausage! Thanks to a generous Christmas gift we received a 7.1 cubic feet deep freezer. Now, its full of awesome pork! 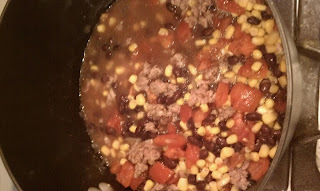 I found the pork, be inspired website and it led me to a Black Bean and Pork Chili recipe. I modified it a little and included the modification below. I made this for 2 adults, 1 preschooler. This went well with the chilly weather we are having in the Midwest! Coat heavy, large covered pot with nonstick cooking spray. Heat over medium-high heat. Add pork, onion, garlic and cumin. Cook and stir until pork is brown and vegetables are tender, stirring occasionally. Drain off fat. Stir black beans, undrained tomatoes, corn, water, oregano, Chipotle powder, pepper and salt into mixture in pot. Bring to boiling; reduce heat. Simmer, covered, for 30 minutes. Uncover; simmer about 15 minutes more or until desired consistency. Stir in lime juice. Serve.